"By involving the readers visually with the information, Sardar and Loon present an interesting cultural view of not only the cultures they are presenting in the book, but their own cultural background as well." Cultural Sudies signals a major academic revolution as we move into the new millennium. But what exactly is it and how is it applied? It is a discipline which claims not to be a discipline - a radical critical approach for understanding racial, national, social and gender identities. 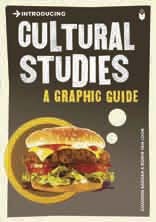 Introducing Cultural Studies provides an incisive tour through the minefield of this complex subject, charting its origins in Britain and its migration to the USA, Canada, france, Australia and Southern Asia, examining the ideas of its leading exponents and providing a flavour of its use around the world. Covering the ground from Gramcsi to Raymond Williams, postcolonial discourse to the politics of diaspora, feminism to queer theory, technoculture and the media to globalization, itserves as an insightful guide to the essential concepts of this fascinating area of study. It is essential reading for all those concerned with the quickening pulse of old, new and emerging cultures. The pages contains lots of grids and frames to contain and provide background for visuals and text - this made a lot of extra work, but I think it was worth it. The whole thing is held together by frequent appearances of a little character I invented whom we came to call 'Cultural Studies Woman'. Yes, she does appear to be little rotund but I don't think she's pregnant, just nicely spherical. at this point, the reviewer laid down his pen (and not before time). About the book: Cultural Studies signals a major academic revolution as we begin the new millennium. But what exactly is it, and how is it applied? it is a discipline that claims not to be discipline- a radical critical approach for understanding racial, national, social, and gender identities. Transcultural Experiments Russian and American Models of Creative Communication by Ellen E. Berry and Mikhail N. Epstein (1999). "Seriously, if you haven't checked out books from this series ("Introducing") before, you really ought to - and this book is a good, cheap place to start. What authors Ziauddin Sardar and Borin Van Loon do is to take the most important cultural studies theorists and make them accessible in everyday, conversational language. And the book looks good while doing it! The aesthetic of the book is really zine-like with short cartoons, short comics and cut-and-paste style graphics. Many of the radical critiques of gender, culture, media and economics found in the other political books (think CrimethInc.) we read and sell a lot of come out of the writing and activism of these theorists. Read this if you're curious what happened in philosophy after Marxism. Read this so that next time that hottie at the coffeeshop is reading Gramsci, you can wow her with your smarts. Read this if you like bell hooks, and want to know more." ...Of course, one reason cultural studies' history is currently being pored over is that it now has a past to revisit. It is this history that is depicted and retold in Sardar and Van Loon's "Cultural Studies for Beginners". 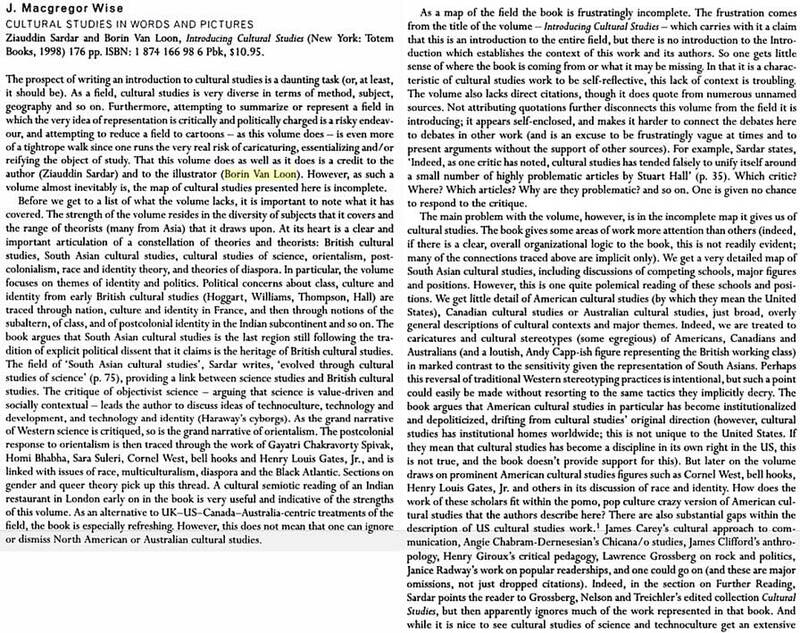 Unlike Sedgwick's methodical alphabetical listing of definitions, this is a text telling a story with a narrative. With its liberally illustrated form containing pictures a-plenty it also radically differs from Edgar and Sedgwick's straight text layout. Sardar and Van Loon's effort is in fact the latest volume in the Icon series, which, itself paralleling the late 20th century popular culture fad of the graphic novel (i.e. comics for grown-ups), explains sometimes dense academic subjects in pictorial-strip style. From the outset the series, like the Guardian's cult Biff cartoons, has had a vaguely cultural studies bent with previous titles on postmodernism, semiotics, Foucault, Baudrillard and the like. This particular title thus plugs a glaring and long-standing gap. Fittingly enough, it is reviewed in Cultural Studies 12(4) by J. Macgregor Wise. This is a great, short introduction to Cultural Studies in comic book form (along the lines of Freud for Beginners) written by a fairly heavy-hitter in the field. An impressive overview. Some professors have had trouble ordering it locally, but it can be ordered from amazon.com for only $8.76. Culture is unto itself a topic of vague proportions and definitions. Dictionaries define culture as “the sum total of ways of living built up by a group of human beings and transmitted from one generation to another” (culture); the ways people live vary and thus what one views as an element of culture may not be as culturally relevant to someone else living in a similar cultural environment. Introducing Cultural Studies, by Ziauddin Sardar and Borin Van Loon attempts to explain some of the broader views of culture (with heavy British flavor) and explain the theories and science behind cultural study by immersing the reader in a book of cultural images and ideas. The element of cultural diversity was an area I found to be quite interesting. The sections provided an interesting insight to a multitude of cultural backgrounds that I might have otherwise not been apt to study or read about. While Introducing Cultural Studies primarily focuses on European nations, it was interesting to see how those cultural diversities translate to my American way of thinking. I believe sometimes, as Americans, we are often rutted into a particular way of thought and a particular style of learning; often overlooking the methods and process and progress of nations other than ourselves. Sardar and Loon’s approach helped bring a new element of progress to the learning process, a process that would not necessarily be used in a traditional American-style book. Through something as simple as the book’s stylized content, I learned that even methods of learning can take on cultural aspects; something that I find to be very important given my future as an educator in today’s global society. Being an Art Education Major, I found the illustrations of Introducing Cultural Studies to be an interesting insight to cultural aspects that would otherwise not be portrayed in a standard text-driven book or essay. By involving the readers visually with the information, Sardar and Loon present an interesting cultural view of not only the cultures they are presenting in the book, but their own cultural background as well. Art is often looked at as a keystone element of a culture’s background and identity; offering a way for generations to come to look back at not only the artist’s view of a culture but the entire culture as a whole, as the culture surrounding the artist influences the very views the artist is trying to portray. In this way, art carries a unique weight in representing a culture’s identity in terms of passing information down to the generations to follow us. Whether it is a painting, a hip-hop song, a movie, or anything in between, art helps define a culture as much as the individuals who create it.